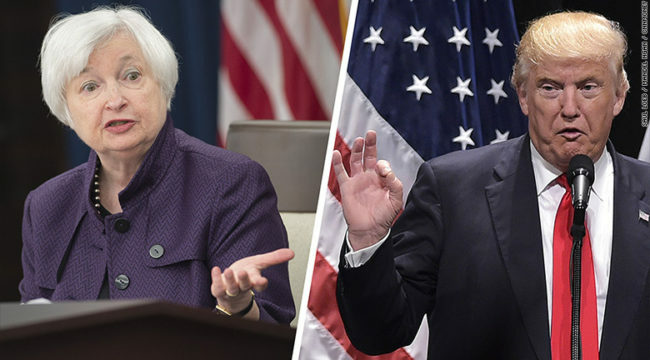 The most decisive factor in the implementation of the Trump economic plan is the reaction of the Federal Reserve. While a Fed rate hike in December was basically a certainty, the path of rates in 2017 following the December hike will be dispositive with regard to the success or failure of Trump’s plans. The Fed can choose to be highly accommodative in the face of Trump’s larger deficits. In effect, the Fed will not anticipate inflation, but will wait until it actually emerges. Actual inflation is still well below the Fed’s target inflation rate of 2%. Since the Fed is targeting average inflation of 2%, it could allow inflation to run above 2% for a while, which would be consistent with 2% average inflation, given today’s lower level. There are many potential catalysts that could trigger such a crisis, including Deutsche Bank, failed gold deliveries, an emerging markets dollar-denominated debt crisis, a natural disaster, etc. The catalyst for such a panic is irrelevant — what matters is the instability of the system as a whole.